This month’s spotlight is on my friend Rebecca, who I started to become friends with as she posted in the Ravelry group and later joined our Slack channel. She is the mother of two little girls with a third on the way. An interesting fact, which has lead her to a very thoughtful and interesting blogging and videocasting ‘career’ is that she is a minister with the Anglican Church of Canada. Her and husband’s careers have lead them to pursue a life in Canada’s Arctic and much of her reflections have to do with life in the Great White North, specifically from Iqaluit, Nunavut. My name is Rebecca Osborn. I am originally from Maryland, USA. I now live in the far north of Canada – Iqaluit, Nunavut, almost the arctic circle – where my husband and I work as priests with the Anglican Church of Canada. We have two little girls, ages 4 and 2, with another one on the way in April! Together we share one job, and juggle the many responsibilities of ministry, parenting, housekeeping, community, and our many hobbies. In addition to spinning I knit, and I’m learning the traditional Inuit craft of sewing with sealskins. My making is very wrapped up with writing, and my blog is about to hit 1000 posts. I crochet and machine sew, but only under duress. I have this habit of adopting mentors – authors, bloggers, whatever. I had been knitting and blogging occasionally when I got married in 2008, and around the same time I discovered Stephanie Pearl McPhee, a.k.a. the Yarn Harlot. I inhaled every word she ever wrote and I wanted to do everything she did. She became my “blogmom”. She helped me learn how to be myself and find my own voice in blogging, and how to knit fearlessly and daringly. Through her I learned that mistakes are much more entertaining than successes. I started spinning because Stephanie spun. I took a drop spindle class at my local yarn shop, and received my first wheel as a Christmas gift in 2009. 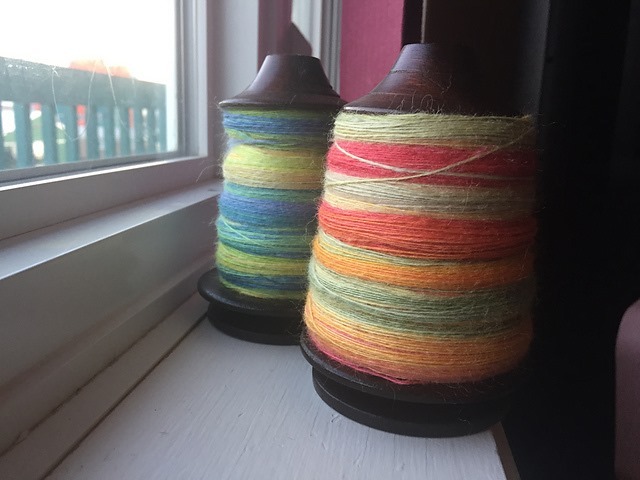 Even though I have been spinning since 2009, and now own three spinning wheels, my relationship with spinning is very on-again, off-again. 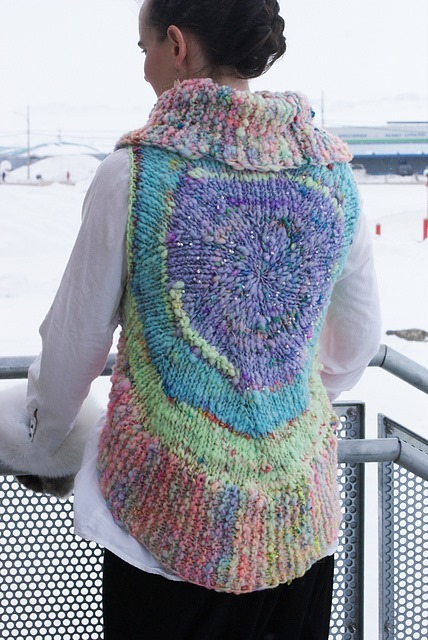 Knitting (and writing, and to a lesser extent designing and natural dyeing) was more my bag. It didn’t help that, despite repeated efforts, I never found a local group of spinners to come alongside. Things got a lot more complicated when I started having kids, though with one kid I still managed to spin on occasion. After my second was born (and I moved 3000 miles), I didn’t spin at all for a long time. Then in January of this year (2017), something happened. I was starting an enormous work project, and I picked up a book about color. 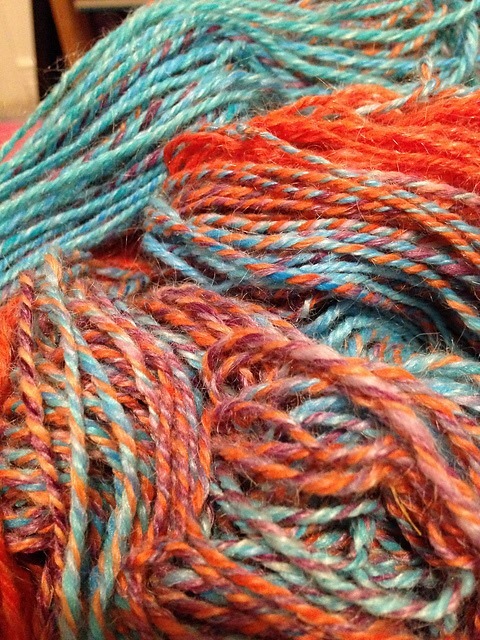 I had the perfect fiber just lying around to experiment with, and it was like being struck by lightening. I was spinning every day, putting colors together, experimenting, just playing. At the exact same time, I discovered Wool n’ Spinning. I “adopted” Rachel right away. Something about her tone and style resonated very strongly with me – maybe because we are at very similar places in family life, but she’s a few years ahead of me. She brought something very new to my spinning process: intention. Intention and strategic experimentation and forethought were something I needed very much at that exact moment, not just in my spinning, but with my big work project, and in my life in general. All through this spring, I learned to sample, to make time every day, to spin intentionally, and I learned so much. So even though I’ve been spinning for nearly a decade, it’s really only this year that I feel like I have become a spinner. I still have incredibly limited time, and some large quantities of fiber to spin through, so I’m hoping to really rock out the worsted weight yarns. My hope within the next year is to crank out a couple of sweater quantities in 2 ply worsted-weight. Because of the preps I have, they will be woollen spun as well, so that will be part of the learning curve. I have spun finer yarns, and am always tempted toward them. But with my life the way it is, the more instant the gratification, the happier I am. I have never been one for peripherals, and I tend to make do with what I can find. My Ashford Traditional is my one-size-fits-all wheel, and I intend to keep it that way for a while. There is room neither in my house, budget, or emotional space for more that that; the other two wheels live in my mom’s house and she visits them when she misses me. I discovered at one point that combs are not for me, but I have fallen in love with my hand cards. A basic 72-tpi pair of curved-backs that I think I picked up on Ebay back before I knew what I was doing, they work great. I found some tutorials that make carding pretty fast and easy, and I find it oddly satisfying. Aside from that, the only tools I keep are the ones that get a lot of use: a ball winder (that ubiquitous Royal kind), a 2-yard niddy noddy, and a needle gauge with a 2″ hole in the middle and a ruler on the side that I find handy for measuring all kinds of things. Otherwise I do a lot of making do. I use my fingers and the needle gauge instead of a WPI tool, a large book instead of a small niddy noddy, and I made a twist angle tool on an index card with a protractor (because my husband hung onto a protractor). It’s not that I don’t think lots of notions are cool, I am just too lazy and cheap to get them for myself. I keep hoping they’ll just appear in my Christmas stocking without me saying anything, but no luck. I think of my spins as either “big spins” or “snack spins.” Big spins are anything more than 4 oz, or anything 4 oz that’s very fine. 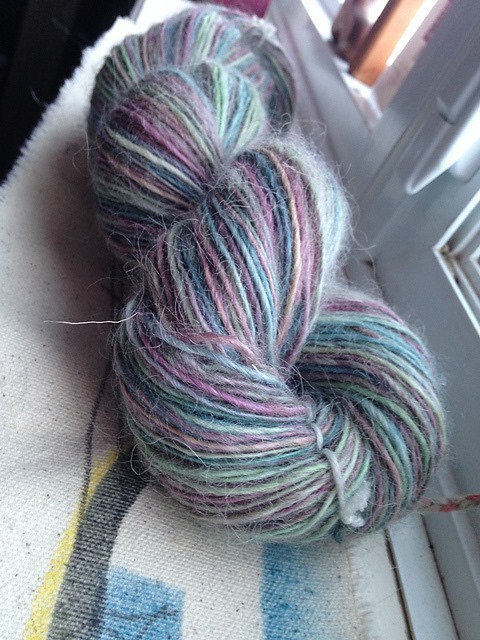 I try to alternate those big spins with “snacks” – 4 oz DK-or-thicker spins that are just for fun. For big spins, I try to be very intentional. I sample, I measure, I think through all the options, I might even have some kind of pattern picked out that I’m shooting for. I know at least generally what I want to knit, though since this process is new to me since January, I have only knit one of those target things! I make a sample card that I refer back to constantly, and a small sample that I keep at my wheel. For snack spins, I throw all of this to the wind. I know more or less what I want, but I often don’t sample, or I’ll use a sample card from another spin. This is a chance to play, to try something different, something fast and satisfying without a lot of repercussions if it goes badly. Basically, the amount of intentionality is directly proportional to the size of the project. This is simply because with a bigger project, you have a LOT more time to second guess yourself and regret hasty decisions. This is mostly an engineering process for me, though there is a meditative aspect to it, in that I can’t make all the big decisions at once. I have to work at it, go away, let it go, and turn it over for a while in the quiet of my mind to think through all the angles. My decisions are best when I make space for this. (This is, however, entirely different from my spiritual practice of meditation, which is about letting go of all my ideas and ambitions and plans, and encountering a Person, for a conversation much bigger than myself.) If you can’t tell, this means I’m quite monogamous with spinning projects. Anything else is just overwhelming. Also overwhelming is stash. 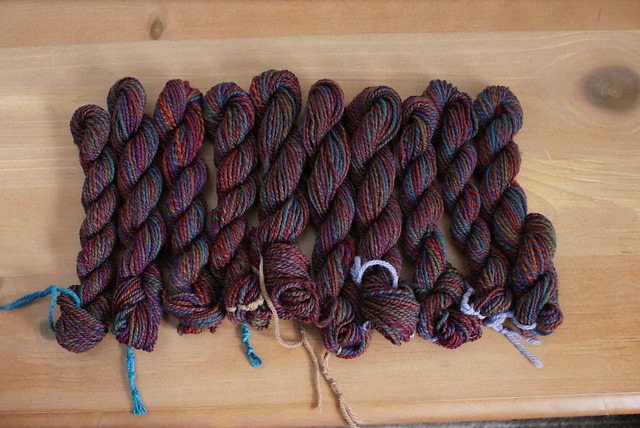 I do try mostly to spin from stash, and I have an entire program for spinning 2 oz from stash for every 1 oz that I buy. 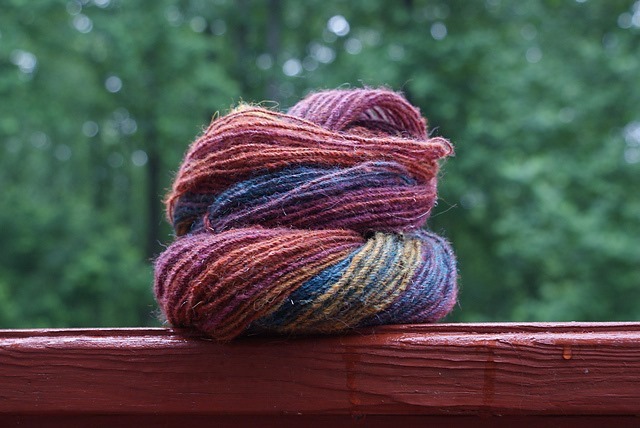 The reason for this is, even though I have had a very on-and-off relationship with spinning for the last eight years, I have always enjoyed buying fiber. My mom lives within a stone’s throw of the Maryland Sheep and Wool festival, and I worked at an amazing booth there for a few years, which did not help! I have culled my stash very severely, but I still have a solid four or five sweater spins in there, and most of it is quite old. 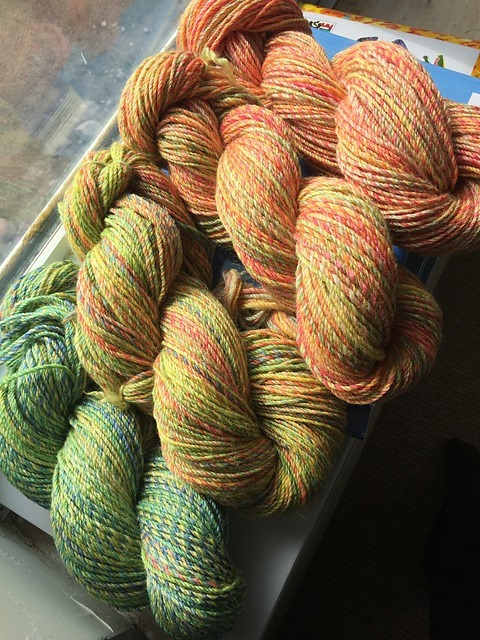 I have wanted to make those yarns for a long time, and I want to make that happen. Because I spin so few hours in the day, relatively speaking, my idea of a “living, breathing stash” (as Rachel likes to talk about, though I forget who coined the phrase – ETA: It was Diana Twiss who I (Rachel) first heard it from!) is one that is very small. I want to be able to just buy what I’m going to spin that year, and spin it ’till it’s gone. At this rate, though, it’ll still take a good few years to get to that point! One thing I am struggling with is how to connect my crafting with my life in the north. I live in a fly-in, fly-out community of around 8,000 people. There are no fiber producing animals on Baffin Island, not even muskox. Lots of folks knit, crochet, and sew, but I know of no one who spins. Okay, I’ve heard tales of one weaver who may own a wheel, but aside from this mystery person, I have to get on a plane to meet the nearest spinner. That means all my spinning community is online, and is why I’ve been so grateful for the Wool n’ Spinning community. The bigger problem is that this means my spinning is entirely disconnected from the rest of my life. Like, I could have written this whole article without giving you any idea of where I live or what I do. It makes me feel very torn in half sometimes. How can I integrate these aspects of my life – mom, priest, northerner, spinner, maker? This is an ongoing question for me and has become a major part of my process. Like, my “life process” if you will. Intentionality. 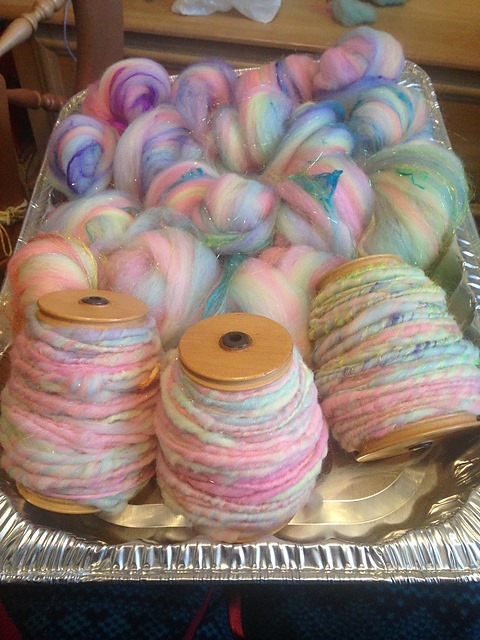 The discovery that I could experiment and sample until I got the yarn I wanted, supplemented with research. Accompanying this was the necessary realization that I am mature enough to be willing to sit down and think things through, not always rushing ahead. I just didn’t have the patience for this process five years ago, maybe even three. Play. All the yarn you make is beautiful; if you doubt this, try looking at it through someone else’s eyes. Try learning one new thing in every spin (or knit, etc.) and you will be shocked how fast you learn. You can’t become an expert all at once, but if you’re patient with yourself, you will be making amazing things in no time. To read more from Rebecca, you can find her here on her blog, on Instagram and Ravelry. Thank you for spending some time with me today and thank you especially to Rebecca for sharing some of her spinning journey with us! 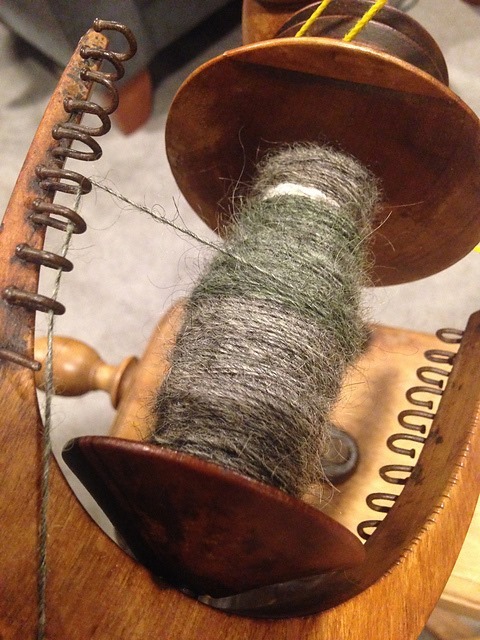 Each month, we learn more from one another in the Wool n’ Spinning community through these Spinner Spotlight posts. If you would like to contribute, please email me: rachel [at] welfordpurls [dot] com and I will send you the questions, or you can nominate someone from our wonderful community and I will approach them! Previous Post Episode 84: Taking you along with me! Next Post just gettin’ things done! Lovely interview. I really enjoyed reading about Rebecca’s spinning ideas, ideals, and strategies. I’m with her on having a huge (not so ‘living and breathing’) stash! But I’m hoping to spin it down over these next couple of years. Thanks for the lovely post! Thanks so much for giving me the chance to share, Rachel! I am so grateful for the community you’ve created and your continual friendship and encouragement.